In these exercises, we explain the use of SALMON from the very beginning, taking a few samples that cover applications of SALMON in several directions. We assume that you are in the computational environment of UNIX/Linux OS. First you need to download and install SALMON in your computational environment. If you have not yet done it, do it following the instruction, download and Install and Run. As described in Install and Run, you are required to prepare at least an input file and pseudopotential files to run SALMON. In the following, we present input files for several sample calculations and provide a brief explanation of the namelist variables that appear in the input files. You may modify the input files to execute for your own calculations. Pseudopotential files of elements that appear in the samples are also attached. We also present explanations of main output files. First 3 exercises (Exercise-1 ~ 3) are for an isolated molecule, acetylene C2H2. If you are interested in learning electron dynamics calculations in isolated systems, please look into these exercises. In SALMON, we usually calculate the ground state solution first. This is illustrated in Exercise-1. After finishing the ground state calculation, two exercises of electron dynamics calculations are prepared. Exercise-2 illustrates the calculation of linear optical responses in real time, obtaining polarizability and photoabsorption of the molecule. Exercise-3 illustrates the calculation of electron dynamics in the molecule under a pulsed electric field. Next 2 exercises (Exercise-4 ~ 5) are for a crystalline solid, silicon. If you are interested in learning electron dynamics calculations in extended periodic systems, please look into these exercises. Since ground state calculations of small unit-cell systems are not computationally expensive and a time evolution calculation is usually much more time-consuming than the ground state calculation, we recommend to run the ground and the time evolution calculations as a single job. The following two exercises are organized in that way. Exercise-4 illustrates the calculation of linear response properties of crystalline silicon to obtain the dielectric function. Exercise-5 illustrates the calculation of electron dynamics in the crystalline silicon induced by a pulsed electric field. The final exercise (Exercise-6) is for an irradiation and a propagation of a pulsed light in a bulk silicon, coupling Maxwell equations for the electromagnetic fields of the pulsed light and the electron dynamics in the unit cells. This calculation is quite time-consuming and is recommended to execute using massively parallel supercomputers. Exercise-6 illustrates the calculation of a pulsed, linearly polarized light irradiating normally on a surface of a bulk silicon. In this exercise, we learn the calculation of the ground state solution of acetylene (C2H2) molecule, solving the static Kohn-Sham equation. This exercise will be useful to learn how to set up calculations in SALMON for any isolated systems such as molecules and nanoparticles. It should be noted that at present it is not possible to carry out the geometry optimization in SALMON. Therefore, atomic positions of the molecule are specified in the input file and are fixed during the calculations. In the input file C2H2_gs.inp, namelists variables are specified. Most of them are mandatory to execute the ground state calculation. This will help you to prepare an input file for other systems that you want to calculate. A complete list of the namelist variables that can be used in the input file can be found in the downloaded file SALMON/manual/input_variables.md. This namelist specifies the unit system to be used in the input file. If you do not specify it, atomic unit will be used. See &units in Inputs for detail. For isolated systems (specified by iperiodic = 0 in &system), the unit of 1/eV is used for the output files of DOS and PDOS if unit_system = 'A_eV_fs' is specified, while atomic unit is used if not. For other output files, the Angstrom/eV/fs units are used irrespective of the namelist value. This indicates that the ground state (GS) calculation is carried out in the present job. See &calculation in Inputs for detail. 'C2H2' defined by sysname = 'C2H2' will be used in the filenames of output files. iperiodic = 0 indicates that the isolated boundary condition will be used in the calculation. al = 16d0, 16d0, 16d0 specifies the lengths of three sides of the rectangular parallelepiped where the grid points are prepared. nstate = 8 indicates the number of Kohn-Sham orbitals to be solved. nelec = 10 indicate the number of valence electrons in the system. Since the present code assumes that the system is spin saturated, nstate should be equal to or larger than nelec/2. nelem = 2 and natom = 4 indicate the number of elements and the number of atoms in the system, respectively. See &system in Inputs for more information. Parameters related to atomic species and pseudopotentials. izatom(1) = 6 specifies the atomic number of the element #1. pseudo_file(1) = 'C_rps.dat' indicates the filename of the pseudopotential of element #1. lmax_ps(1) = 1 and lloc_ps(1) = 1 specify the maximum angular momentum of the pseudopotential projector and the angular momentum of the pseudopotential that will be treated as local, respectively. dl = 0.25d0, 0.25d0, 0.25d0 specifies the grid spacings in three Cartesian directions. See &rgrid in Inputs for more information. The following namelists specify whether the output files are created or not after the calculation. Cartesian coordinates of atoms. The first column indicates the element. Next three columns specify Cartesian coordinates of the atoms. The number in the last column labels the element. Calculated orbital and total energies as well as parameters specified in the input file are shown in this file. A cube file for electron density. For isolated systems (specified by iperiodic = 0 in &system), atomic unit is adopted in all cube files. 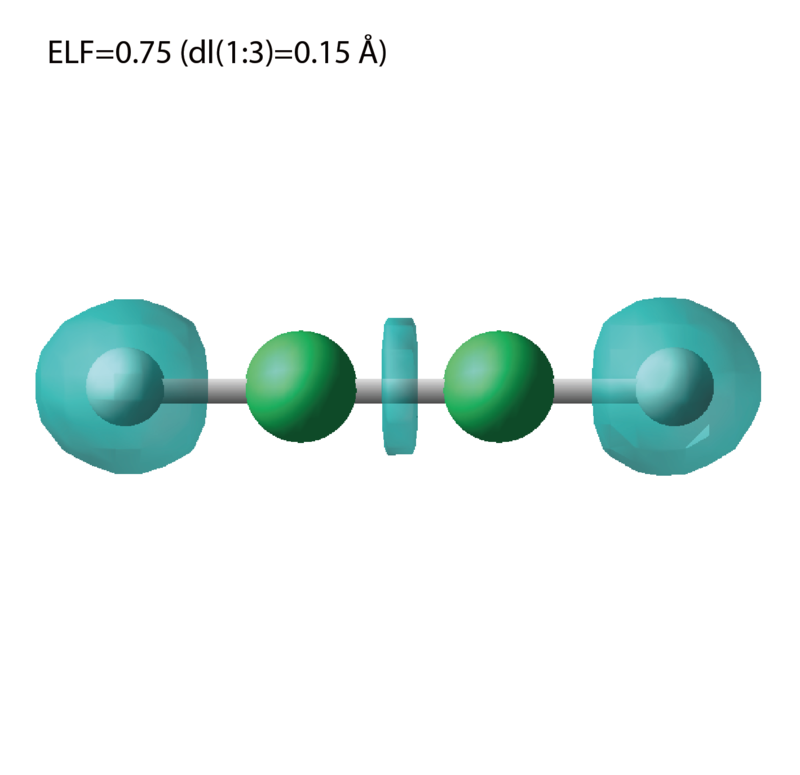 A cube file for electron localization function (ELF). Cube files for electron orbitals. The number in the filename indicates the index of the orbital..
A file for density of states. The units used in this file are affected by the input parameter, unit_energy in &unit. Files for projected density of states. The units used in this file are affected by the input parameter, unit_energy in &unit. The number in the filename indicates the order of atoms specified in &atomic_coor. We show several image that are created from the output files. The output files psi1.cube, psi2.cube, ... are used to create the image. The output files dns.cube, ... are used to create the image. The output files elf.cube, ... are used to create the image. In this exercise, we learn the linear response calculation in the acetylene (C2H2) molecule, solving the time-dependent Kohn-Sham equation. The linear response calculation provides the polarizability and the oscillator strength distribution of the molecule. This exercise should be carried out after finishing the ground state calculation that was explained in Exercise-1. In the calculation, an impulsive perturbation is applied to all electrons in the C2H2 molecule along the molecular axis which we take z axis. Then a time evolution calculation is carried out without any external fields. During the calculation, the electric dipole moment is monitored. After the time evolution calculation, a time-frequency Fourier transformation is carried out for the electric dipole moment to obtain the frequency-dependent polarizability. The imaginary part of the frequency-dependent polarizability is proportional to the oscillator strength distribution and the photoabsorption cross section. To run the code, the input file C2H2_rt_response.inp that contains namelist variables and their values for the linear response calculation is required. The binary file C2H2_gs.bin that is created in the ground state calculation and pseudopotential files are also required. The pseudopotential files should be the same as those used in the ground state calculation. In the input file C2H2_rt_response.inp, namelists variables are specified. Most of them are mandatory to execute the linear response calculation. This will help you to prepare the input file for other systems that you want to calculate. A complete list of the namelist variables that can be used in the input file can be found in the downloaded file SALMON/manual/input_variables.md. This indicates that the real time (RT) calculation is carried out in the present job. See &calculation in Inputs for detail. These namelists and their values should be the same as those used in the ground state calculation. See &system in Exercise-1. These namelists and their values should be the same as those used in the ground state calculation. See &pseudo in Exercise-1. dt=1.25d-3 specifies the time step of the time evolution calculation. nt=5000 specifies the number of time steps in the calculation. ae_shape1 = 'impulse' indicates that a weak impulse is applied to all electrons at t=0 epdir_re1(3) specify a unit vector that indicates the direction of the impulse. See &emfield in Inputs for details. Cartesian coordinates of atoms. The first column indicates the element. Next three columns specify Cartesian coordinates of the atoms. The number in the last column labels the element. They must be the same as those in the ground state calculation. In this exercise, we learn the calculation of the electron dynamics in the acetylene (C2H2) molecule under a pulsed electric field, solving the time-dependent Kohn-Sham equation. As outputs of the calculation, such quantities as the total energy and the electric dipole moment of the system as functions of time are calculated. This tutorial should be carried out after finishing the ground state calculation that was explained in Exercise-1. In the calculation, a pulsed electric field that has cos^2 envelope shape is applied. The parameters that characterize the pulsed field such as magnitude, frequency, polarization direction, and carrier envelope phase are specified in the input file. To run the code, following files are used. The C2H2_gs.bin file is created in the ground state calculation. Pseudopotential files are already used in the ground state calculation. Therefore, C2H2_rt_pulse.inp that specifies namelist variables and their values for the pulsed electric field calculation is the only file that the users need to prepare. C2H2_rt_pulse.inp input file that contain namelist variables and their values. In the input file C2H2_rt_pulse.inp, namelists variables are specified. Most of them are mandatory to execute the calculation of electron dynamics induced by a pulsed electric field. This will help you to prepare the input file for other systems and other pulsed electric fields that you want to calculate. A complete list of the namelist variables that can be used in the input file can be found in the downloaded file SALMON/manual/input_variables.md. dt=1.25d-3 specifies the time step of the time evolution calculation. Nt=4800 specifies the number of time steps in the calculation. ae_shape1 = 'Ecos2' indicates that the envelope of the pulsed electric field has a cos^2 shape. epdir_re1 = 0.d0,0.d0,1.d0 specifies the real part of the unit polarization vector of the pulsed electric field. Using the real polarization vector, it describes a linearly polarized pulse. laser_int_wcm2_1 = 1.d8 specifies the maximum intensity of the applied electric field in unit of W/cm^2. 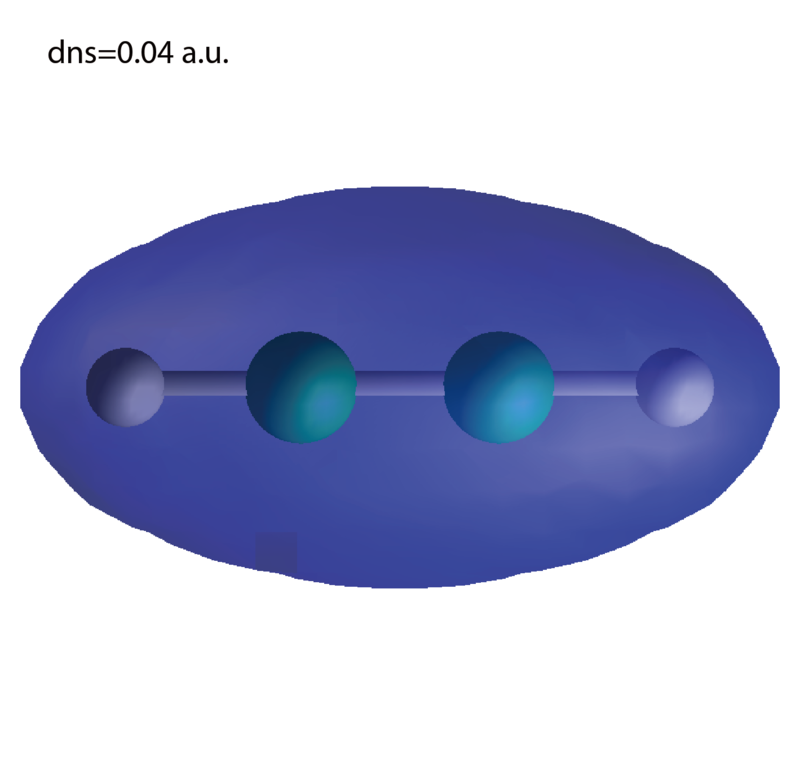 omega1=9.26d0 specifies the average photon energy (frequency multiplied with hbar). pulse_tw1=6.d0 specifies the pulse duration. Note that it is not the FWHM but a full duration of the cos^2 envelope. phi_cep1=0.75d0 specifies the carrier envelope phase of the pulse. As noted above, 'phi_cep1' must be 0.75 (or 0.25) if one employs 'Ecos2' pulse shape, since otherwise the time integral of the electric field does not vanish. See &emfield in Inputs for details. In this exercise, we learn the linear response calculation of the crystalline silicon of a diamond structure. Calculation is done in a cubic unit cell that contains eight silicon atoms. Since the ground state calculation costs much less computational time than the time evolution calculation, both calculations are successively executed. After finishing the ground state calculation, an impulsive perturbation is applied to all electrons in the unit cell along z direction. Since the dielectric function is isotropic in the diamond structure, calculated dielectric function should not depend on the direction of the perturbation. During the time evolution, electric current averaged over the unit cell volume is calculated. A time-frequency Fourier transformation of the electric current gives us a frequency-dependent conductivity. The dielectric function may be obtained from the conductivity using a standard relation. Si_gs_rt_response.inp input file that contain namelist variables and their values. In the input file Si_gs_rt_response.inp, namelists variables are specified. Most of them are mandatory to execute the calculation. This will help you to prepare the input file for other systems that you want to calculate. A complete list of the namelist variables that can be used in the input file can be found in the downloaded file SALMON/manual/input_variables.md. epdir_re1 = 0., 0., 1. This indicates that the ground state (GS) and the real time (RT) calculations are carried out sequentially in the present job. See &calculation in Inputs for detail. 'Si' defined by sysname = 'C2H2' will be used in the filenames of output files. iperiodic = 3 indicates that three dimensional periodic boundary condition (bulk crystal) is assumed. al = 10.26d0, 10.26d0, 10.26d0 specifies the lattice constans of the unit cell. nstate = 32 indicates the number of Kohn-Sham orbitals to be solved. nelec = 32 indicate the number of valence electrons in the system. nelem = 1 and natom = 8 indicate the number of elements and the number of atoms in the system, respectively. See &system in Inputs for more information. izatom(1) = 14 indicates the atomic number of the element #1. pseudo_file(1) = 'Si_rps.dat' indicates the pseudopotential filename of element #1. lloc_ps(1) = 2 indicate the angular momentum of the pseudopotential that will be treated as local. This indicates that the adiabatic local density approximation with the Perdew-Zunger functional is used. We note that meta-GGA functionals that reasonably reproduce the band gap of various insulators may also be used in the calculation of periodic systems. See &functional in Inputs for detail. num_rgrid=12,12,12 specifies the number of the grids for each Cartesian direction. See &rgrid in Inputs for more information. This namelist provides grid spacing of k-space for periodic systems. dt=0.16 specifies the time step of the time evolution calculation. nt=3000 specifies the number of time steps in the calculation. propagator = 'etrs' indicates the use of enforced time-reversal symmetry propagator. See &propagation in Inputs for more information. This namelists specify parameters related to the self-consistent field calculation. ncg = 5 is the number of conjugate-gradient iterations in solving the Kohn-Sham equation. Usually this value should be 4 or 5. nscf = 120 is the number of scf iterations. epdir_re1(3) specify a unit vector that indicates the direction of the impulse. trans_longi = 'tr' specifies the treatment of the polarization in the time evolution calculation, transverse for 'tr' and longitudinal for 'lo'. See &emfield in Inputs for detail. nenergy=1000 specifies the number of energy steps, and de=0.001 specifies the energy spacing in the time-frequency Fourier transformation. Cartesian coordinates of atoms are specified in a reduced coordinate system. First column indicates the element, next three columns specify reduced Cartesian coordinates of the atoms, and the last column labels the element. Results of the ground state as well as input parameters are provided. Orbital energies in the ground state calculation. Results of time evolution calculation. Ac_ext_x,y,z are applied vector potential. For transverse calculation specified by trans_longi = 'tr', Ac_tot_x,y,z are equal to Ac_ext_x,y,z. For longitudinal calculation specified by trans_longi = 'lo', Ac_tot_x,y,z are the sum of Ac_ext_x,y,z and the induced polarization. The same relation holds for electric fields of E_ext_x,y,z and E_tot_x,y,z. Jm_x,y,z are macroscopic current. Eall and Eall-Eall0 are total energy and electronic excitation energy, respectively. ''Tion' is the kinetic energy of atoms. Temperature_ion is the temperature estimated from the atomic motion. Force acting on each atom during time evolution. In transverse calculation specified by trans_longi = 'tr', time-frequency Fourier transformation of the macroscopic current gives the conductivity of the system. Then the dielectric function is calculated. In this exercise, we learn the calculation of electron dynamics in a unit cell of crystalline silicon of a diamond structure. Calculation is done in a cubic unit cell that contains eight silicon atoms. Since the ground state calculation costs much less computational time than the time evolution calculation, both calculations are successively executed. After finishing the ground state calculation, a pulsed electric field that has cos^2 envelope shape is applied. The parameters that characterize the pulsed field such as magnitude, frequency, polarization, and carrier envelope phase are specified in the input file. Si_gs_rt_pulse.inp input file that contain namelist variables and their values. In the input file Si_gs_rt_pulse.inp, namelists variables are specified. Most of them are mandatory to execute the calculation. This will help you to prepare the input file for other systems that you want to calculate. A complete list of the namelist variables that can be used in the input file can be found in the downloaded file SALMON/manual/input_variables.md. iperiodic = 3 indicates that three dimensional periodic boundary condition (bulk crystal) is assumed. al = 10.26d0, 10.26d0, 10.26d0 specifies the lattice constans of the unit cell. nstate = 32 indicates the number of Kohn-Sham orbitals to be solved. nelec = 32 indicate the number of valence electrons in the system. nelem = 1 and natom = 8 indicate the number of elements and the number of atoms in the system, respectively. See &system Inputs for more information. ae_shape1 = 'Acos2' specifies the envelope of the pulsed electric field, cos^2 envelope for the vector potential. epdir_re1 = 0.,0.,1. specify the real part of the unit polarization vector of the pulsed electric field. Specifying only the real part, it describes a linearly polarized pulse. laser_int_wcm2_1 = 1d14 specifies the maximum intensity of the applied electric field in unit of W/cm^2. omega1=0.05696145187d0 specifies the average photon energy (frequency multiplied with hbar). pulse_tw1=441.195136248d0 specifies the pulse duration. Note that it is not the FWHM but a full duration of the cos^2 envelope. trans_longi = 'tr' specifies the treatment of the polarization in the time evolution calculation, 'tr' indicating transverse. Fourier transformations of various quantities. In this exercise, we learn the calculation of the propagation of a pulsed light through a thin film of crystalline silicon. We consider a silicon thin film of 53 nm thickness, and an irradiation of a few-cycle, linearly polarized pulsed light normally on the thin film. 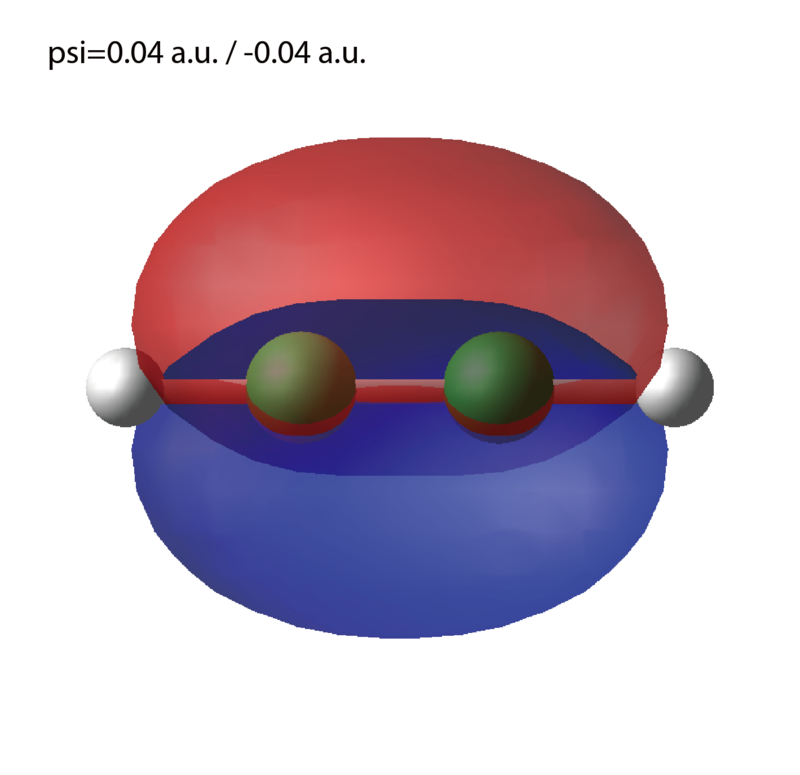 First, to set up initial orbitals, the ground state calculation is carried out. The pulsed light locates in the vacuum region in front of the thin film. The parameters that characterize the pulsed light such as magnitude and frequency are specified in the input file. The calculation ends when the reflected and transmitted pulses reach the vacuum region. Si_gs_rt_multiscale.inp input file that contain namelist variables and their values. In the input file Si_gs_rt_multiscale.inp, namelists variables are specified. Most of them are mandatory to execute the calculation. This will help you to prepare the input file for other systems that you want to calculate. A complete list of the namelist variables that can be used in the input file can be found in the downloaded file SALMON/manual/input_variables.md. calc_mode = 'GS_RT' indicates that the ground state (GS) and the real time (RT) calculations are carried out sequentially in the present job. use_ms_maxwell = 'y' indicates the multi-scale Maxwell - TDDFT calculation. See &calculation in Inputs for detail. iperiodic = 3 indicates that three dimensional periodic boundary condition (bulk crystal) is assumed. al = 10.26d0, 10.26d0, 10.26d0 specifies the lattice constans of the unit cell. nstate = 32 indicates the number of Kohn-Sham orbitals to be solved. nelec = 32 indicate the number of valence electrons in the system. nelem = 1 and natom = 8 indicate the number of elements and the number of atoms in the system, respectively. isym = 8 and crystal_structure = 'diamond', which indicates that the spatial symmetry of the unit cell is used in the calculation. Although the use of the symmetry substantially reduces the computational cost, it should be used very carefully. At present, the spatial symmetry has been implemented only for the case of the diamond structure. See &system in Inputs for more information. dt=0.08 specifies the time step of the time evolution calculation. nt=4000 specifies the number of time steps in the calculation. propagator = 'middlepoint' indicates that Hamiltonian at midpoint of two-times is used. See &propagation in Inputs for more information. laser_int_wcm2_1 = 1d12 specifies the maximum intensity of the applied electric field in unit of W/cm^2. This namelist specifies information necessary for Maxwell - TDDFT multiscale calculations. fdtddim specifies the spatial dimension of the macro system. fdtddim='1D' indicates that one-dimensional equation is solved for the macroscopic vector potential. nx_m = 4 specifies the number of the macroscopic grid points in for x-direction in the spatial region where the material exists. hx_m = 250d0 specifies the grid spacing of the macroscopic grid in x-direction. nxvacl_m = -2000 and nxvacr_m = 256 indicate the number of grid points in the vacuum region, nxvacl_m for the left and nxvacr_m for the right from the surface of the material. Information on k-points. Note that diamond symmetry is used to reduce the k-point in this calculation. The number in the file name specifies the iteration number. Various quantities at a time are shown as function of macroscopic position. column 1-3: grid number of macroscopic coordinate in 3D format. Vector potentials at vacuum points adjacent to the medium are shown, L for left and R for right adjacent point. The number in the file name specifies the macroscopic grid point in a medium. Various quantities at a macroscopic point are shown as functions of time. © Copyright 2018, SALMON developers.